1 The earth had cooled. Clouds had formed. Rain had fallen. 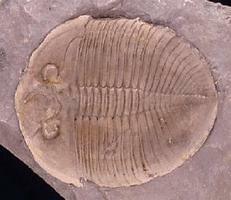 Organisms were already living on earth at the beginning of the Paleozoic Era. During this time, life became more complex. 2 Shallow seas covered most of the continents. This was a perfect place for life to grow. Early in the era, most organisms were invertebrates. These are animals without backbones. Trilobites were plentiful. They were arthropods that lived in shallow water. There were also many brachiopods. These animals looked like clams. Soft-bodied animals like sponges also lived at this time. 3 Coral was very plentiful during this time. Scientists have learned much about the earth during the Paleozoic Era by studying coral. Coral adds new material to its shell each day. This forms growth lines.